Figure A29. Cocos anomaly, interpreted as the Cocos slab, with (horizontal) [vertical] cross sections through (A)[D] the UUP07 p-wave) and (B)[D] the combined SL2013 and S40RTS s-wave models at 1290 km; C) the location of the modern geological record that we interpret to have formed during the subduction of the slab. The Cocos anomaly (Figure A29) is part of the set of anomalies commonly, and in our previous compilation in van der Meer et al. (2010), referred to as the Farallon slab, as originally defined by Grand et al. (1997) and also imaged by Fukao and Obayashi (2013) and Sigloch and Mihalynuk (2013). 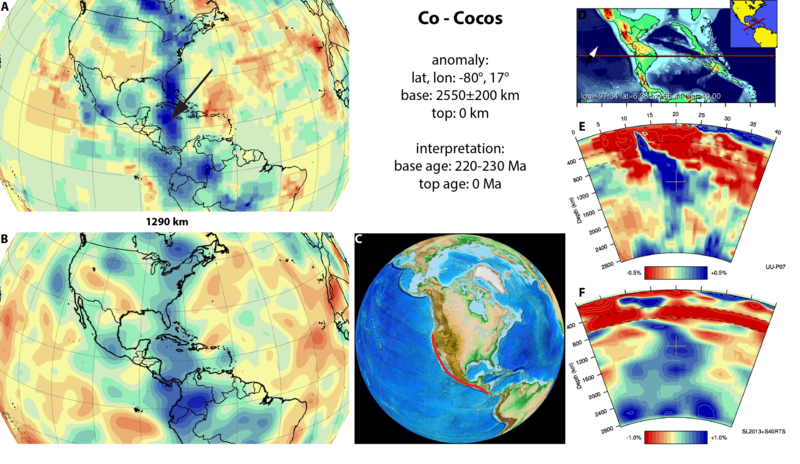 The anomaly is interpreted as the Cocos slab and is NW-SE trending, and dips from the Central American trench, where it connects to the subducting Cocos plate, down to the lower mantle below the northern Caribbean region and eastern North America. Rogers et al. (2002) showed tomographic images of the Cocos slab below Central America and suggested that it may have detached in recent times at a depth of ~200-300 km, but our tomographic model does not reveal this gap. Recently detached or not, the Cocos slab is longest contiguous anomaly in our database. It can be distinguished from the Hatteras slab, although it may connect with this slab at mid-mantle depths, where it locally assumes a N-S strike. Above 1100 km depth the NW-SE strike reappears, all the way up towards the Central American trench. The location of the deepest part of the anomaly is corresponds to the slabs that (Sigloch and Mihalynuk, 2013) interpreted as resulting from Franciscan intra-oceanic subduction, forming their SF1 slab, which resides at shallower depth. We adopt their interpretation, and extend the SF1 slab into the deepest mantle. The Cocos slab is the only still-subducting segment of the once vast Farallon oceanic plate and is currently subducting the Cocos plate below Mexico. Correlating the Cocos slab to the Franciscan melange predicts that North America moved northward relative to the Cocos slab during its subduction, which may be tested in future studies. Although there is debate when the ‘Franciscan’ phase of subduction initiated, most agree that subduction was underway by 170-160 Ma, the time of formation of high temperature – high-pressure metamorphic rocks in the structurally higher levels of the Franciscan complex (Anczkiewicz et al., 2004; Wakabayashi and Dumitru, 2007; Hoisch et al., 2014; Wakabayashi, 2015), which we adopt as the minimum age of the start of subduction of the Cocos slab. It’s interesting that the slabs don’t seem to last more ~300MY. That’s about the upper limit of oldest oceanic crust. Is it a coincidence or is there more to it?